Okay. I laughed pretty hard at this. Thanks for the chuckle. Oh, it’s quite funny, and true. 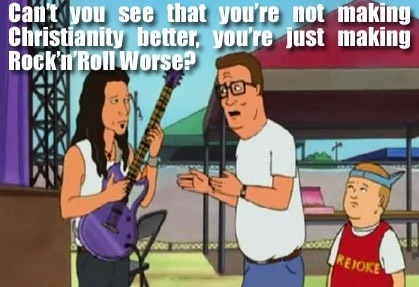 “We’re gonna rock out for Jesus!” And I’m like fine, but can you learn to play the guitar first? LOL yes this is funny. I even remember this episode of King of the Hill (it’s probably really old). This is too true too. Gimme an organ and a hymnal please. And maybe acoustic if ya know how to play.